Dragon Well Shrimp is a simple traditional Chinese dish that incorporates the world famous Dragon Well Tea. This recipe originates from the same region as Dragon Well tea, the Hangzhou province of China. 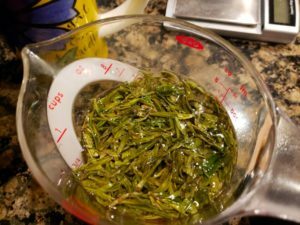 It is easy to make and can actually be made with other teas as well. Heat the oil in a large flat pan and put in the shrimp. You will want to spread out the shrimp in the pan so they do not overlap to ensure even cooking. You will want to pour out any leftover marinade in the bowl. As the shrimp cook, pour in the tea and stir in the tea leaves. The tea and marinade should thicken into a sauce. Turn the shrimp about 2 minutes into cooking. 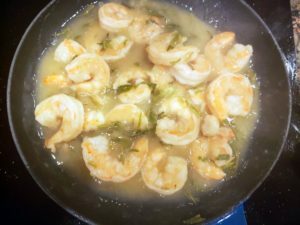 After 4 minutes, if your sauce is not fully thick, remove the shrimp to a plate and continue cooking the sauce until it thickens. Then turn off the heat and put back in the shrimp. Taste the sauce and add salt to your taste. The tea leaves will soften and be very easy to eat with the shrimp. Other green and white teas can be used for this recipe. Black and oolong teas will be much tougher and are not ideal for this unless you chop the leaves after brewing. This is a fun way to appreciate tea.